I honestly tried to write a post based on the second act of Hickman’s run and I really struggled. It was going to be in the form of a poster and I was making progress, but towards the end of the story I was lost. I think it was when I realised that Avengers World was almost a separate story and continuity to the Avengers and New Avengers that it was not going to form a coherent overall arc. This was quite frustrating to the point where I lost faith in Hickman and I just did not think they were going to tie in. 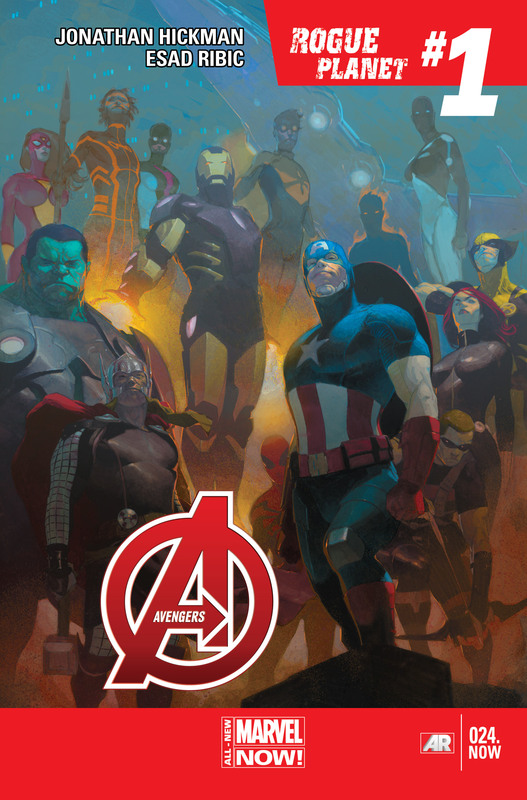 Avengers World did culminate before it entered into this Axis story, and the themes of magic, mystical powers, the undead, giant monsters and other superhero teams finished in a hurry. There are many links to the Hickman books, mainly focusing on characters that do not play a role in Avengers and New Avengers. In any case those two books continued regardless of Avengers World and so we have now entered the third act, 8 months later. We have a lot to get through so I have decided to tackle each book separately and the cast as individuals. Before we start I have provided a summary of the post, because I am sure many people would not want to read it all! You can skip this because it does feature at the end with my own thoughts on Hickman’s writing afterwords. What is actually happening in the multiverse? The Black Priests, the Mapmakers and the Ivory Kings are three massively destructive forces that are destroying parallel Earths for one reason or another. We have yet to establish this completely but we can assume the Ivory King is probably a megalomaniac, the Mapmakers (whose precursors are Adaptoids that were created by A.I.M. probably from some future stolen tec.) are charting worlds and destroying those that need eliminating, and the Black Priests are altogether something different. We now know that Stephen Strange sold his soul to become the leader of these priests, and has immense power channelled through words. So much power, that it can destroy a world but he states that they are only triaging those decaying and doomed worlds, in order to save others. So it appears he will be on the side of the Avengers when the time comes to face Mapmakers and the Ivory King. It is worth mentioning that many universes have seen groups of heroes and villains amalgamate to help save their world. These include many incarnations of Illuminati and their world destroying weapons, the Cabal, who have taken over the task on our Earth and The Great Society who were killed by our Illuminati. These represent the primary defence to their Earths being destroyed, but ultimately they need weapons to destroy opposing planets to actually survive. This is where the morality of our Avengers waivers so delicately. What is actually happening on Earth 616? We seem to be massively distracted by the one-man mission of Steve Rogers to capture the Illuminati. They are no longer in power and are fractured into pieces. Meanwhile there are news reports of The Cabal destroying worlds and S.H.I.E.L.D. seems to be massively uninterested. Cap will not forgive Tony for betraying him and creating the Illuminati and then allowing them to expel him. Add in Sue who is pretending to hate Reed, and the good soldiers Maria, Clint and Carol and you have S.H.I.E.L.D. not the S.H.I.E.L.D. Avengers as we seem to be insistent on calling them. 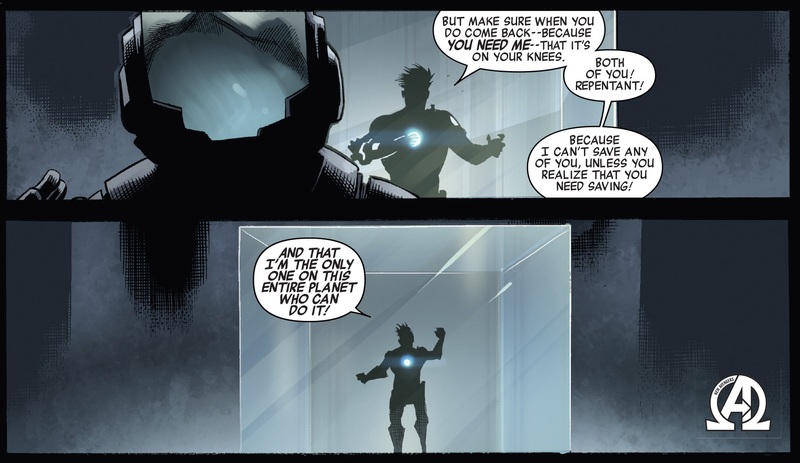 Tony Stark remains incarcerated by the Cabal and no one seems to be interested in rescuing him, except for Widow and Spider-woman who decided against it. I find it amusing how easy it was for them to find him when S.H.I.E.L.D. and the Illuminati have failed. Let us not forget Bobby da Costa who has actually taken an interest in the multiverse, sent out an Avengers force to tackle it using A.I.M. tech that he now owns, and then try to settle the differences between the Illuminati and Steve. Let be honest, they need to merge. Steve must remove his arrogance from the situation and face reality that the world is going to die without rescuing Tony and reforming the Avengers. Then they can sort out the Multiverse situation and remove the Cabal from the equation. Oh wait! Wasn’t that the point of Infinity? Issue 24.NOW was quite the interesting issue because it stood alone in the continuity of the rest of the act. The Rogue Planet chapter set up a few base premises. Firstly it had an Iron Man in the future try to save the Earth from a rogue planet and devise a method of two worlds inhabiting the same space. 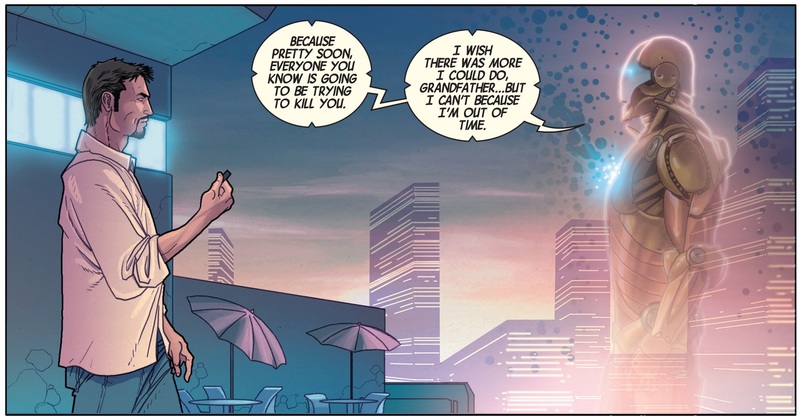 But what was actually happening was that future Iron Man was actually his granddaughter, giving him some advice and the rogue planet was actually a energy source for him in the future. She gave ominous signs about his betrayal and his friends turning on him as a consequence. It was an impressive issue because, not only did it allow a technology where two Earths could co-inhabit (never mentioned again except with the Great Society) but it set up the fall of Tony Stark. The next few issues focused upon A.I.M. and alternate universe Avengers and a new future tech, the Adaptoids. It is a very clever tactic to move the story forward and introduce radical changes to characters in a sudden jump. It means we can just miss stuff out and get to the endgame, and completely shift the status quo or restore continuity at the drop of a hat. For example Steve Rogers is now old which fits the Remender story and is in pursuit of the Illuminati. This is a sensible transition as the Avengers issue where he jumped forward in time were all over the place, and resulted in his firm opposition of his former teammates. Tony is incarcerated after trying to stop the Cabal and now sits in a box being irritated by Black Swan, a nice little role reversal. However we have skipped an essential aspect of his story: The fall. He is broken and attempted something beyond his control and now people have lost faith in him. In fact it is his attitude and arrogance that keeps him from being rescued by Natasha and Jessica. There is a story in place that I hope we return to because it seems like an incredible one. Avengers vs Adaptoids and parallel Avengers but most importantly it is focused upon Bruce discovering the Illuminati exists and joining them. Cap recalls the expulsion from the Illuminati and travels to the future with the time gem to learn more about the consequences of their current path. He becomes very angry. So what happened to the “Avengers”? Due to the mass segregation that has taken place over the past eight months, we effectively have three groups of Avengers, which excludes the Illuminati. I thought it would be helpful to recap what has happened which each member of these groups as a reference. Sunspot – After being involved in the knockout of the Avengers in Perth, way back in issues #15 and #16 of Avengers, we haven’t seen much of him. It is quite interesting that the DNA was taken from our fallen heroes at that time and used to spawn these Adaptoid clones, which don’t appear until issue #27. It is also amazing because of Pod because this creature was deemed a villain but now has joined Sunspot’s Avengers. Otherwise Sunspot was pretty quiet, I appreciate he was part of Avengers World but in Hickman’s continuity he didn’t feature until eight months later. He now is all-important because he had taken over the A.I.M. business and is utilising the information gathered by the Zebra kids, Starbrand/Nightmask to piece together the destruction of the multiverse. He has sent the Multiversal Avengers on a one-way trip through the Auger (A.I.M. technology) to solve the puzzle (A#36). He is then given the task of reforming the Avengers from S.H.I.E.L.D. and the Illuminati, which occurred in the latest issue (A#39). He has been a busy man indeed! Cannonball – He is very rarely seen away from Sunspot’s side but at the eight-month juncture he seems to have fallen in love with Smasher and started to live in the Shi’ar Empire, and have a baby! This is not a huge surprise given that Smasher is part of the Imperial Guard, but when Bobby comes to visit, he lures them both back to Earth, obviously to join the Avengers. 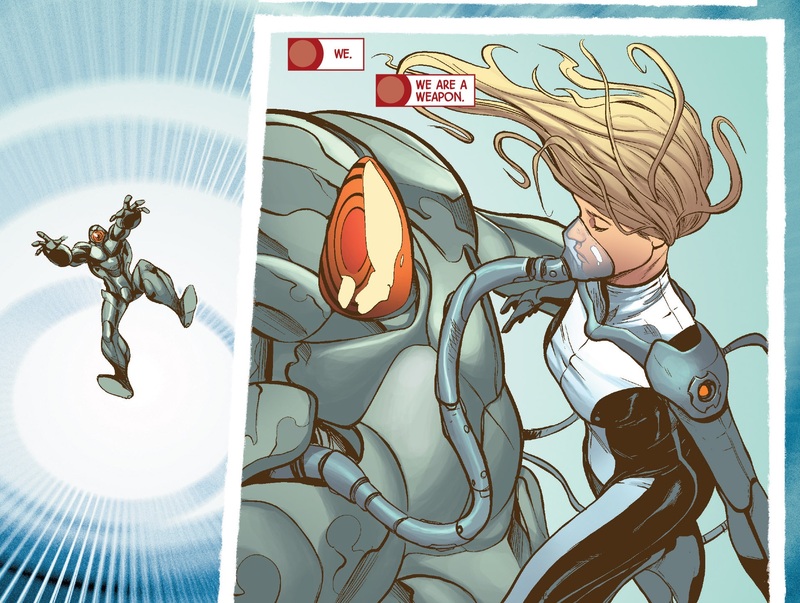 Smasher – Similar to above where she hasn’t been seen for a long while but did make an appearance in issue #27 where the Avengers fought the parallel Avengers. She now is part of Sunspot’s Avengers. If you read Avengers World then you will notice she was enticed by A.I.M. becoming brainwashed and supremely powerful. The breaking of mind control brought about her rescue by a kiss from Sam Guthrie, her lover to be (AW#14). Manifold – Now this chap has been busy. 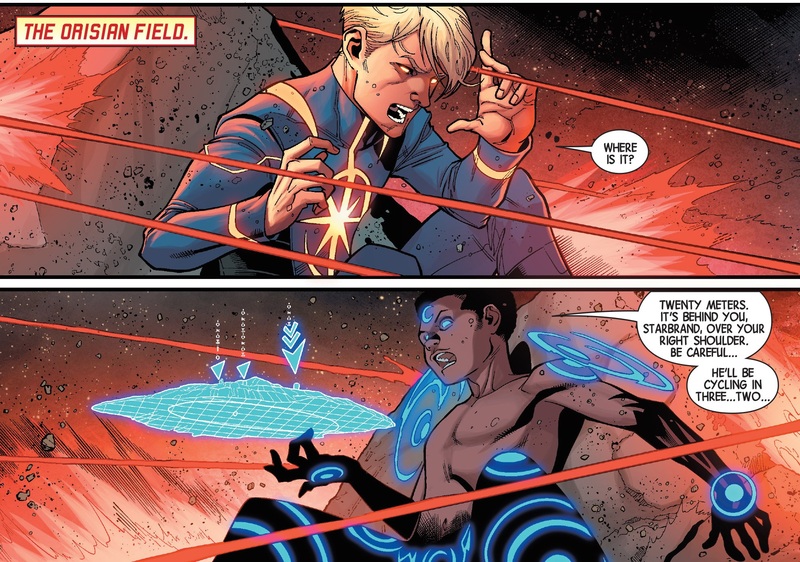 He lost his connection to the universe in Avengers World and needed Captain Universe to fix him. He was then heavily involved in those stories, including teleporting the Avengers kids too (yes that was a feature of that book). He hasn’t really featured in the second arc of Avengers or New Avengers. Eight months later he helps Bobby transport to Sam’s home to bring him back to become part of his Avengers. He is involved in the discussions of Avengers #38 where he professes he doesn’t know who is good or bad anymore. He has struggled more than we realise and he even went off world to an incursion site in Avengers World #5. Captain Universe helped him through these moral conundrums but he is quite a tormented man. Black Widow – Natasha has been busy throughout the Avengers books as a firm member of that team. Not only is she everywhere in Avengers World but also she is part of the Avengers group fighting parallel universe Avengers. Then Cap confides in her about the betrayed by the Illuminati (A#29) and she joins him in confronting Tony before the time gems sends them hurtling into the future. She even lasts until issue #32 before being dropped back to the present. When Cap returns she seems to be firmly on his side but given the next issue is eight months later, we don’t know why she joins Sunspot’s Avengers. In issue 38 of the Avengers, her and Jess reference their visit to Tony but state their allegiances to Bobby’s group. The only mention to why she left Steve’s side was that his righteousness was proving too costly. That is also the same reason why she cannot save Tony, he is too strong and powerful to be released not realising the error of his ways. 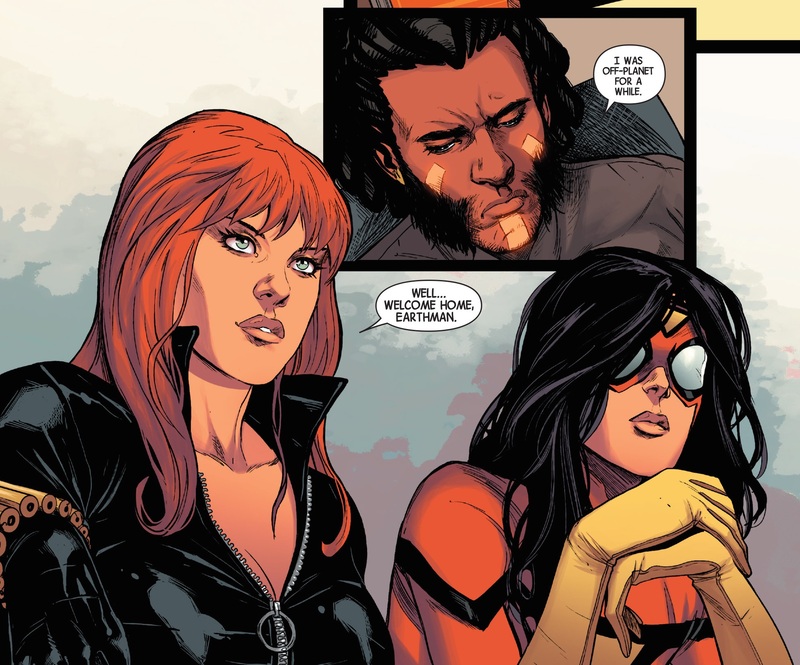 Spider-Woman – Jessica has also featured in Avengers World (City of the Dead issues) but has been utilised very little in Hickman’s books, in fact I don’t think she appeared at all in the second act of the Avengers. She joins Natasha in the third act and is now part of Bobby’s crew. 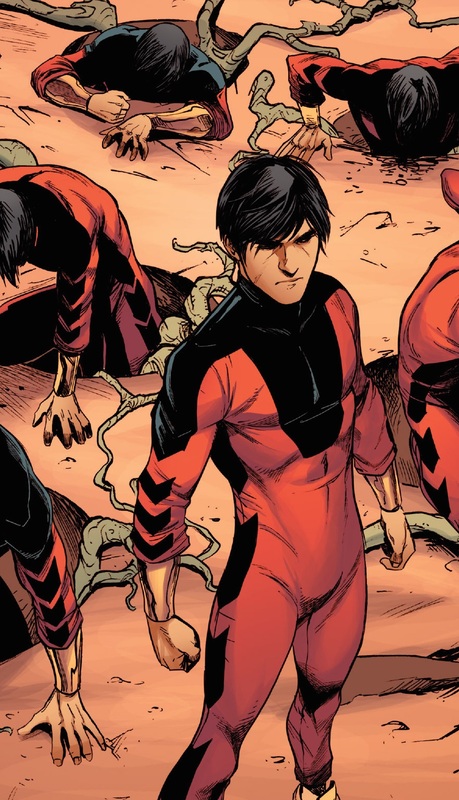 Shang-Chi – This is one interesting character as he underwent a difficult personal journey in Avengers World, one that led to his fall at the hands of the Gorgon. Only to return, using Pym particles, to become an actual giant fighting the Madripoor carrying monster. He was not seen at all in the second act but he finally appeared in issue #38 at the reproduction origin site. It is here that we see Bobby’s secret weapon, the power of self-replication and an army made up of multiple Shang-Chis. Validator – This was referenced way back in Avengers #10, at the evolution origin site. Aside from a very mild reference in Avenger World #1, she has only made a reappearance in this third act. She actually hasn’t said anything and we have only seen her in issues #38 and #39 and that she has the power of evolution. We await her new power set and maybe for her to say something. Pod – This was a robot that was unveiled at the self-defence origin site (A.I.M. island) and it immediately headed to the communication site. As Pod took out the Avengers, Superia of A.I.M. command captured it and place it into the Auger, jailed in between dimensions (A#17). It appears that when the origin site was initially created, the machinery had found Aikku, a Norwegian girl who was chosen to cohabit its space. They became a weapon and were rescued by Bobby when he took over A.I.M. hence why she is an Avenger. It is worth noting that this auger was where Hyperion was kept incarcerated. Zebra Kids – The zebra kids have been popping up every time we see Hyperion in a casual manner. They were borne in the Savage Land and represent self-sustenance of the origin sites. Hyperion and Thor have become parents to these kids and as Hyperion readies to enter the multiverse, he bids them a fond farewell (A#36). In the third act they have rapidly grown up and are now employees of Bobby and A.I.M. responsible for the technical and inventive advances of the company. It is fair to say they have also joined the Avengers and are integral to the technological side of the company. This group of heroes has been called the New Avengers and are quite a unified group. Especially considering throughout act one and Avengers World, these people were often seen together, especially Sam, Bobby, Smasher, Widow and Shang Chi. It seems quite likely that the plans for New Avengers and Avengers did not feature these members and so Nick Spencer was given a free run at them. He must’ve built a new story but had to include the foundation members too such as Cap, Hawkeye, Widow etc. 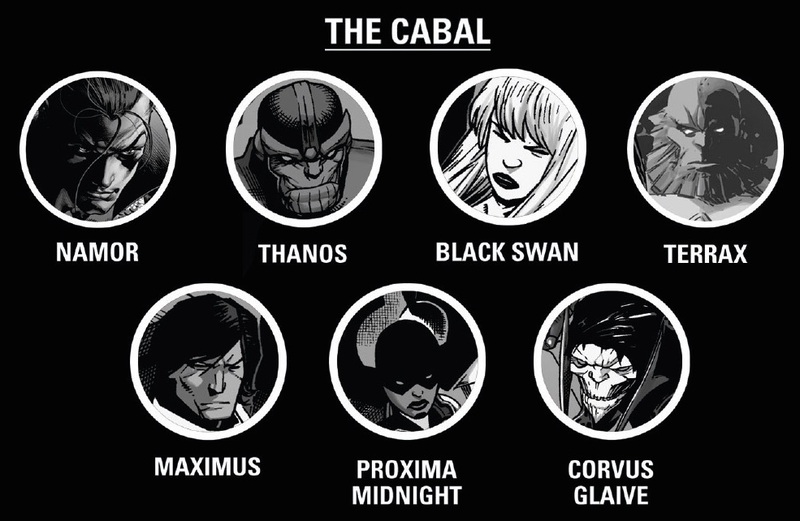 This would be where the continuity becomes askew and confuses the Hickman titles somewhat. But now the third arc has brought the bigger picture into view, we can see the whole again. The additions of the origin site heroes are a welcome one and ushers in a new order of Avengers heroes. They haven’t actually done much yet but are readied for action, however Thor and Hyperion form the bulk of the story as they head into the auger. Steve Rogers – Well at this moment he is no longer Cap because Remender made him old and powerless, in keeping with Sam taking over the mantle. This was a momentary interjection occurring somewhere in the eight months later time period. It is pleasant to have some continuity in place but we should look at what has actually happened to Cap. Aside from begin part of the Avengers in the parallel Avenger storyline; he played no significant role except to fight within it. This was really a story about the A.I.M. Adaptoids and Bruce joining the Illuminati. The second story arc was all Steve with the odd Avenger falling by the timeside. When he gets to Betrayal + 51,028 years he finally has an explanation from Kang & Immortus about the genesis of this fractured time. They stated that the parallel universes are still collapsing and in the past Steve was instructed to help Tony. This plan failed and so now these future villains, sitting outside of regular time, are asking Cap to remain away from the situation. The weighing up of lives and universes is an equation Rogers refuses to try and solve. He saves lives, that is what he does. The solution is simple to Cap and he will not waiver from this standpoint. It is a lovely idea but ultimately someone has to make the tough decisions as we enter the lesser of two evil arguments. There is an actual position that involved not making the decision, which is essentially where Steve sits. This is the crux of the Iron Man Captain America dynamic. Rogers is refusing to participate and attacks the time gem, thus transporting back home with a new option. One that future Hawkeye told him, to destroy the monster Tony Stark. There was a confrontation somewhere along the lines because once we hit issue #35, we were eight months later and everything had suddenly changed. Steve is old and in a black outfit and is determined to stop the Illuminati who are now underground. They seem to have stopped preventing the destruction of other worlds, and that purpose is now all of a sudden given to the Cabal. Rogers appears to be content with that for some reason and only focuses on a mission to find his former friends and punish them. This story has little to do with the destruction of universes and Cap’s focus even comes into dispute when Bobby’s Avengers effectively join with the Illuminati in the latest issue (A#39). 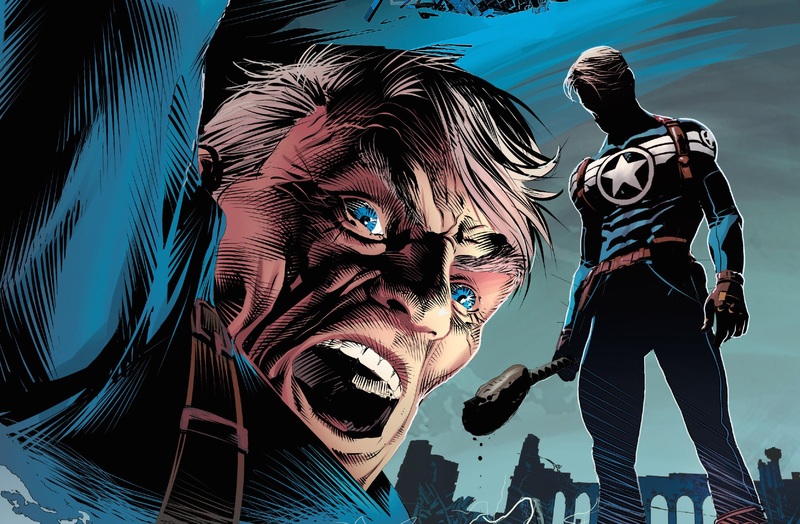 Cap’s betrayal has turned him into a single minded stubborn old man, who may have lost that little bit of perspective. One that is a necessity if you really want to save everyone. Sue Richards – I don’t think I have even seen Sue around the Avengers stories previously. She appears to have become an adjunct to the Reed story, where his disappearance does have repercussions on the family. Her lead role in the field team suggests she has climbed the ranks on a personal vendetta against her husband. It would fit quite nicely because his neglectfullness is relatively common and it is not a far jump to assume she would be angry. However it then becomes apparent that she is working undercover for the Illuminati and keeping tabs on Reed without Cap knowing (A#37). I think there will inevitably be a combined S.H.E.I.L.D. force once Cap comes to his senses because clearly Sue will not be fighting against her husband for long. 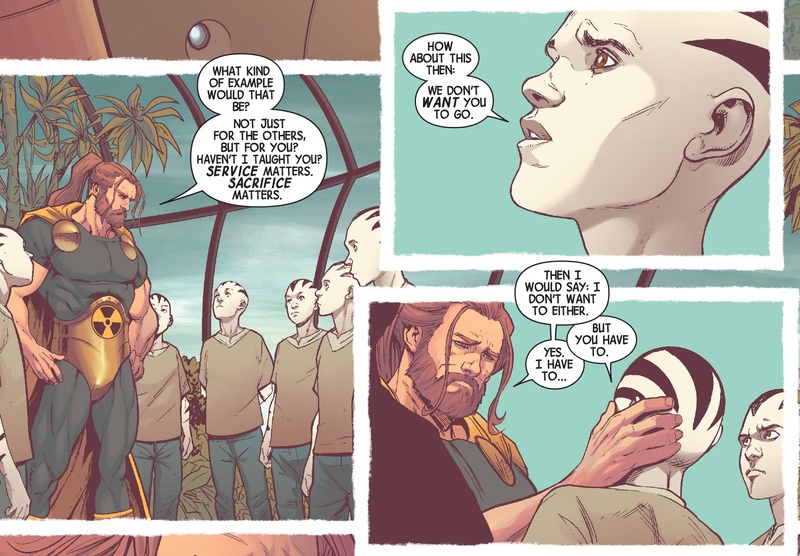 Captain Marvel – Carol has been on the quieter side throughout Hickman’s Avengers. I recall she was quite impressive in the Infinity saga but since then her role is that of a powerhouse in the group. She played her part in the Adaptoid clone fights but was not involved in the time gem future jumps. She plays a similar role now with Cap’s Avengers and is once again the muscle. There is little alluding to her own thought and opinions and may be playing the part of a good solider. Maria Hill – Maria has been in charge of S.H.E.I.L.D. for a while now and whilst A.I.M. had the parallel universe Avengers and Adaptoids, she was trying to find out what was happening. To be the fair the story was never about S.H.E.I.L.D. or even the Avengers, it was all to do with Bruce and these machines. She is now working alongside Steve chasing the Illuminati. 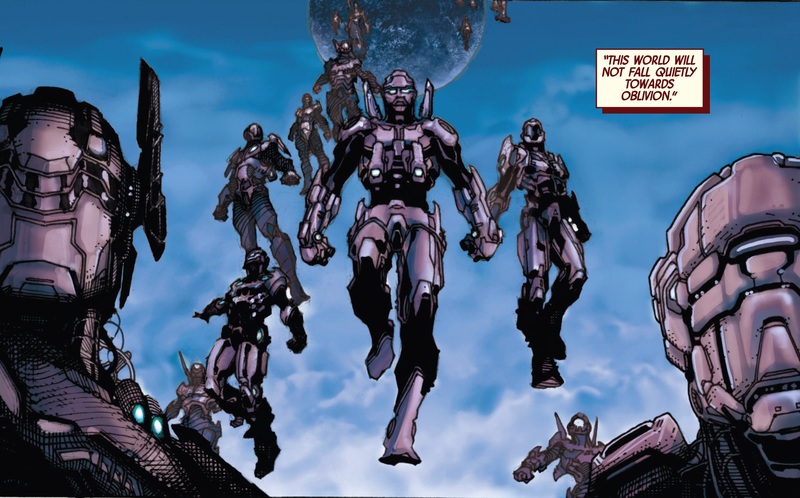 War Machine Drones – The Iron Man tech has become a part of the S.H.E.I.L.D. armoury, though whether this is because of Tony supplying old schematics or Rhodey supplied the hardware remains to be seen. However War Machine is the main controller and is pushing his limits in directed an army of machines (A#39). 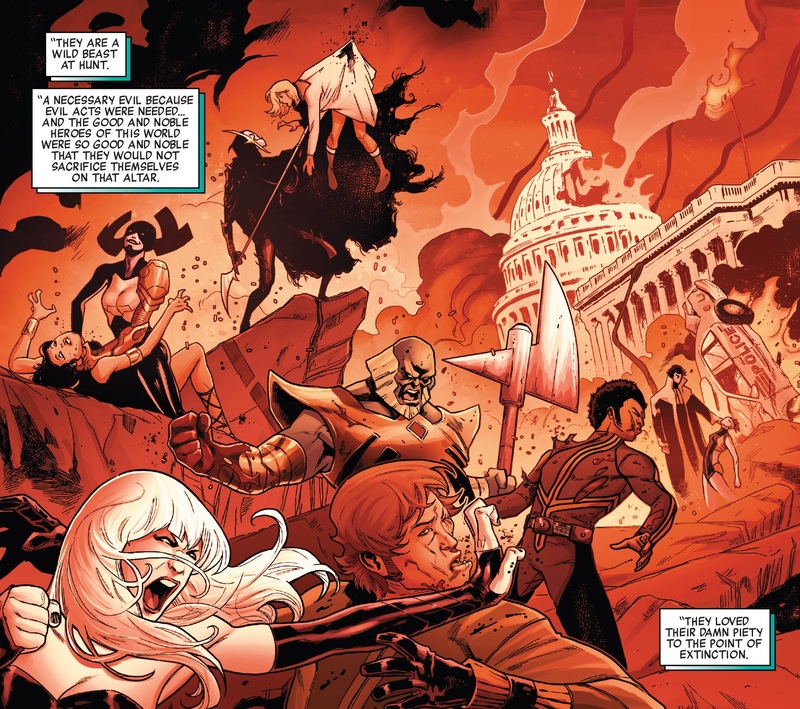 Captain America – I do love the continuity respect that Hickman has for the Marvel Universe. So within the eight months we see Steve lose the shield and become an old man, with Sam taking over the mantle. He was part of the Avengers World story but has no role previously in the Hickman books. He is now part of the S.H.I.E.L.D. Avengers. Hawkeye – It does irritate me somewhat that Clint is not utilised more but he has been around the whole time. He was part of the gang with the Adaptoids and was part of Steve’s journey in time. He did have an essential part in issue #30, betrayal + 48yrs, where he confronts Tony and the devastation he causes in the earlier time. This gives us little information about current events but sets up hatred for Tony, letting us know that Clint is a survivor. Maybe that is the consequence of his poor utilisation. Hyperion – Hyperion is genuinely a nice guy and a father figure to the Zebra kids. He is also a good friend to Thor throughout the books. His origin was that he was pulled form a parallel universe that he was unable to save. He was rescued via the auger by A.I.M. and joined the Avengers in the first act (See previous Hickman post). He has become an integral part of the group and is seen deliberating with Maria in issue #26 and is seen fighting alongside Cap and Thor later in the arc. The Avengers #34.1 book was a lovely book about him trying to be a hero on our Earth and has lovely flashbacks of him learning lessons from his father. This is a rapport he is desperate to try and emulate. Thor – As the Odinson wields Jarnbjorn in his disgrace, he has become quiet and mardy as time has passed. 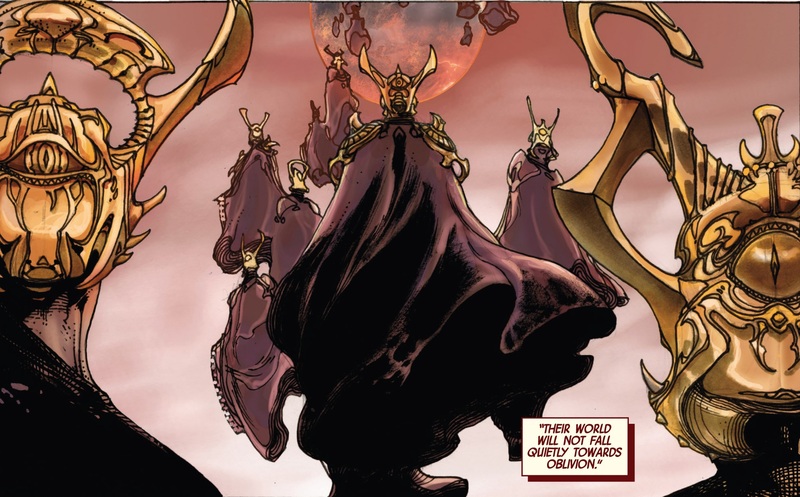 Once again Hickman pays respect to Aaron’s version of the character, even showing the parallel universe Thor, called Thorr, wield a hammer stating that he who is unworthy shall hold it. This then becomes his weapon in issue #27, bringing back the power of lightening he has missed so much. This part of the story harks back to the Adaptoid arc where he fights along side the others holding Mjolnir. Thor also has a small role with the time jumping and Illuminati confrontations, but this is only in issue #31 where his future self talks to him. Future Thor says to his younger self that he does not know what it means to be unworthy and he stares longingly at Mjolnir. It’s interesting how far back Hickman knew that Thor was going to fall. Both Hyperion and Thor leave Cap at betrayal + 422 years. Hyperion seems to be the only source of solace for Thor as they regularly meet and drink together. Quite often Thor appears to be quiet and lost in his own thoughts. 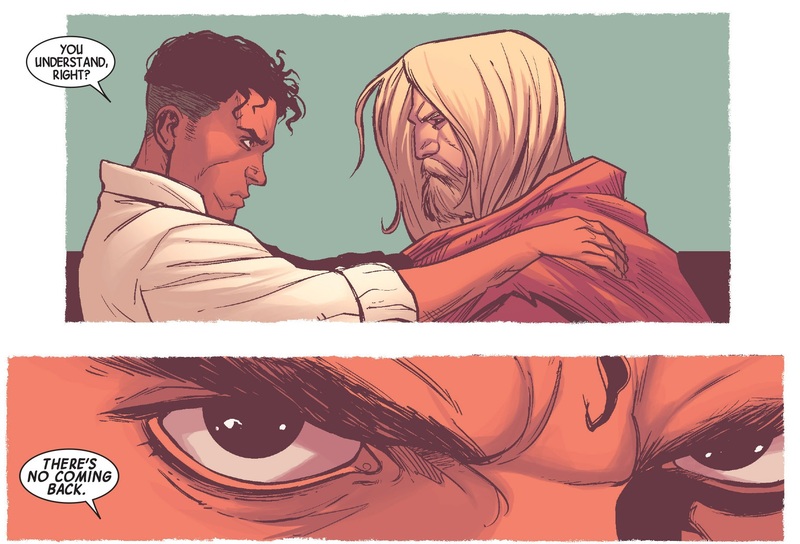 Roberto has a quiet word with the Odinson before they enter the auger, and feels that he is underserved of the role of repairing the Avengers whilst Thor heads into the abyss. Thor’s misery is abated by the opportunity to salvage his soul by dying with righteousness (A#36). Starbrand & Nightmask – Now for some bizarre reason both Starbrand and Nightmask are becoming younger. It was alluded to during their battle with an Aleph and there has yet to be an explanation. It may just be a gimmick to add some interest to two characters who haven’t developed much. 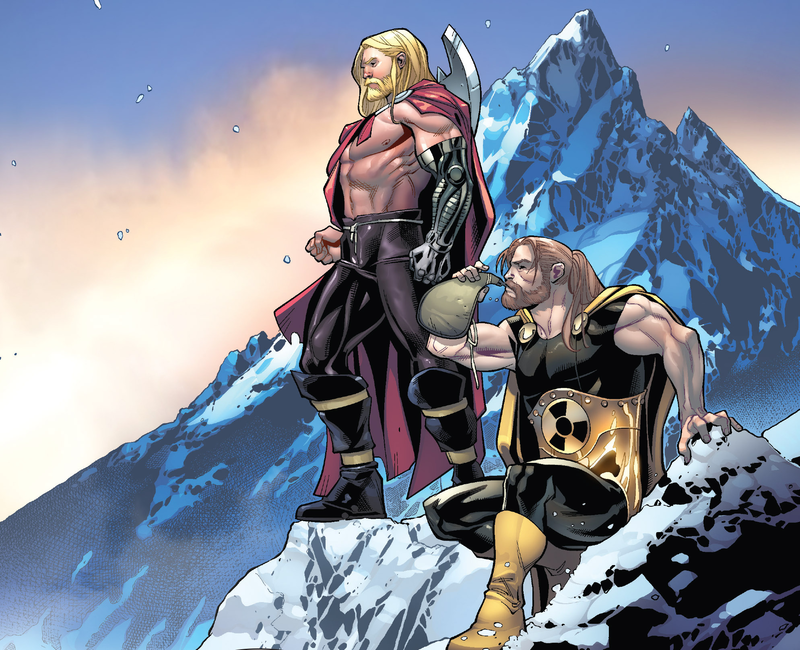 In any case these two friends are joining Thor and Hyperion as they enter the auger. The course of events is not entirely clear because Starbrand was part of the Avengers when Cap time jumped, but not part of the Adaptoid arc. He was with Steve until issue #32, after he finds out that he died courageously and passed his sigil onto a worthy successor. Between then and eight months later, he joins up with Nightmask, who hasn’t been seen since Infinity, and they enter the multiverse. It is interesting how Bobby calls upon their help just as they find out that the multiverse is collapsing. They reported that their concerns have now become Bobby’s and they comment on the Aleph that was expelled from a dying universe. Abyss and Ex Nihilo – From the liberation of these two gardeners in the Infinity saga, they have been travelling to different universes trying to save them. Sadly they are finding little success and are losing numbers as they try. Way back in Infinity, there was a comment from the Builders suggesting that Earth was the focal point of the Multiversal collapse. 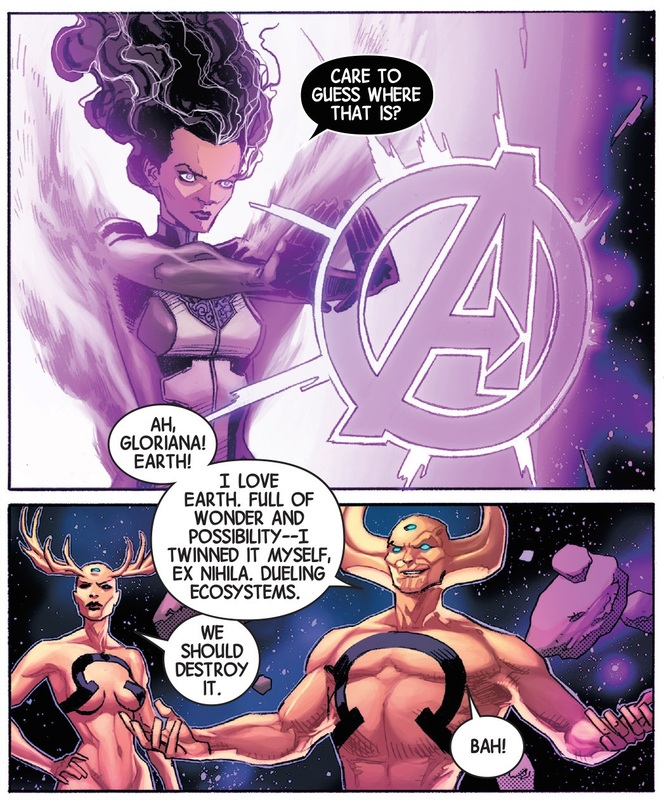 This was uttered by Abyss in issue #35 as she realises the Avengers are the key to everything. They travel to Earth and converge with Bobby. In issue #36 we can see Abyss describe the necessity for Ex Nihilii to travel to the centre of the Earth to understand its importance. The world is scarred and dying and they need to investigate why the attempts to repair and build anew, by Ex Nihilii and Starbrand, have failed. There is a concept at play that the universes wish to die, they choose to allow death, this unsettles many of the Gardeners. There is a lovely monologue by Ex Nihilo that states that a planet is life in a void of nothingness and the universe is returning to an equilibrium called nothing. 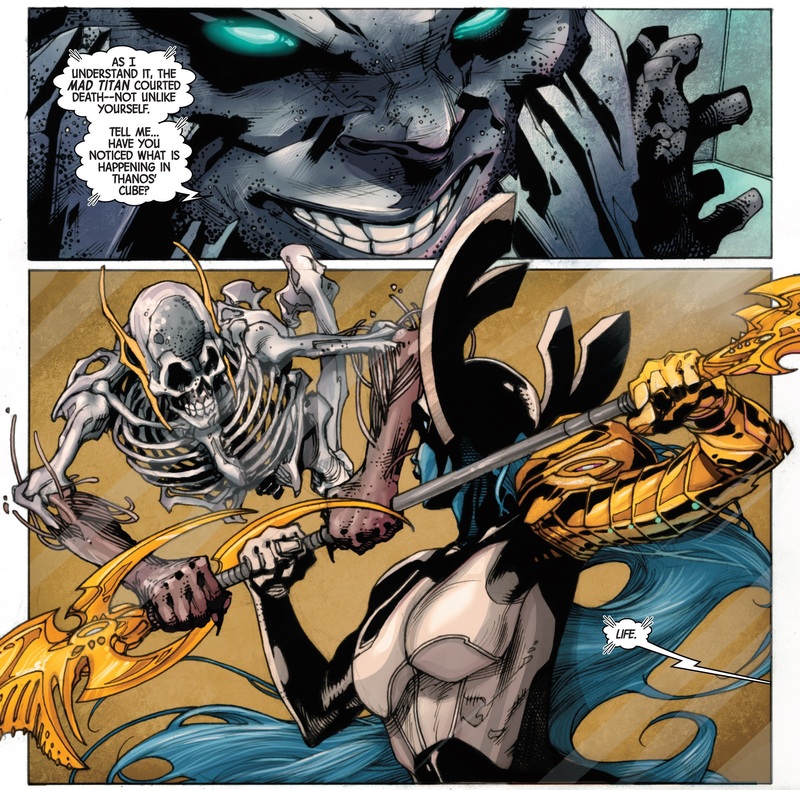 Ex Nihilo means life and he will not stand to let this happen, and so he takes his sister Abyss and enters the auger completing the Multiversal Avengers team. The later issues of Avengers and New Avengers feature the Multiversal Avengers. They travel to a strange universe and meet Stephen Strange and the Black Priests. This part of the story will be addressed when we discuss Dr Strange. It is also worth mentioning that the Adaptoid creatures that were created by A.I.M. escaped into the Auger and travelled to meet the Mapmakers. They then evolved and became one of them, which is essential in understanding that A.I.M. may be the initiators of the androids who are responsible for creating the blue incursions. It is quite difficult to approach these issues on an individual basis because of the essential story arcs. The following is a quick summary before we enter into the details of the characters, followed by the Great Society story and eight months later. These three issues expanded the ideas of the incursions and how to plan for them. We saw further details on the other destroyers of worlds, including the Swans, Black priests and Mapmakers. This revealed another incursion against a group of mutants headed by Magneto himself and the power of Phoenix eggs. The Illuminati included Dr Doom, Reed, Pym, Iron Man and Captain Britain. This time it was against the Sideris Maris and the Mapmaker robots. They manage to chart the Earth and subsequently destroy the world without hesitancy, again under the gaze of a nervous Earth-616 Illuminati. Reed manages to expand the mirror to be able to see into time, seeing into the past as well as the future. They use it to look for Swans or more accurately their Black Swan, which is the focus of NA#15. They only catch three glimpses of her, one being rescued by another Swan and killing a Black Priest, another was of her sacrificing a being on an alter for the great Rabum Alal. Most interestingly we see a final image of her interacting with an old Tony Stark and Reed Richards. They are questioning her beliefs, as men of science they are disappointed by her ritualistic endeavours. They don’t doubt for long as they soon die for the Great Wheel and Rabum Alal. This sends the fear of God into our Illuminati as they decide to keep Swan incarcerated for a little while longer. 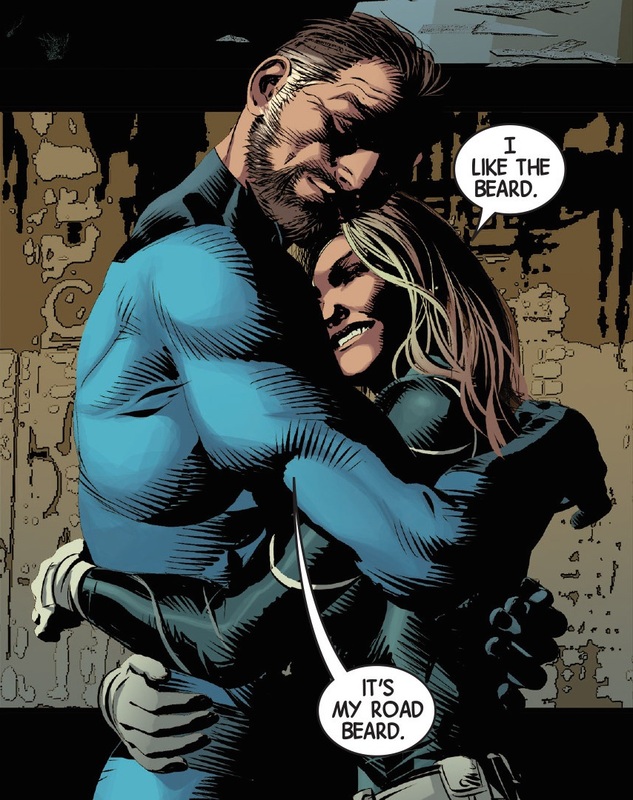 Reed Richards – Interestingly we do not see much of Reed outside of group scenarios. He is ever-present at the investigative mirror issues and the following arc shows him focused upon the incursions of The Great Society. However the main character focus of that story is the rapport between Namor and Panther. He has been developing his weapons and is part of the collective that decides they just cannot do it anymore. There is some character exposition with regards to his wife and how much he misses his children. He does receive a cryptic message from Valeria during the eight months later story. Bruce Banner/Hulk – It takes a few issues for the Hulk to become part of the Illuminati. 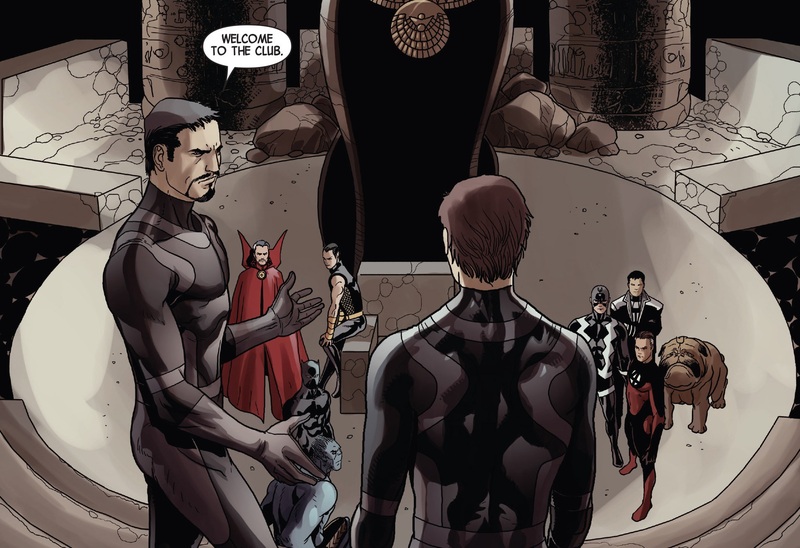 Bruce realised there was a secret society quite early on in the Avengers Adaptoid arc, in fact that becomes the fundamental aspect of that story. Whilst the Avengers fought the parallel universe duplicates, Bruce decides to take on the role of his doppelgänger. Actually both Banners engage in an interesting conversation in a Hulk proof room in issue 27. The alternate Bruce has had a lobotomy to remove the emotional centres of his brain, meaning that the Hulk can now be controlled via electronic stimuli. He hunted down the current Hulk in order to devise a plan for him to stay in the present universe, as theirs was destroyed. Our Bruce ends up assaulting his twin in order to test the anger management theory, surprisingly it works and he remains unconscious allowing Bruce to take his place. He even enters the Avengers vs Avengers fight and attacks his teammates (A#27) in order to appear convincing and obtain information. Interestingly the fight is stopped by A.I.M. who take all the bodies and send them to an alternate destination via, yup you guessed it, the auger. So before our Bruce enters the auger he asks A.I.M. what is happening and the multiverse theory is revealed to him (A#28), this is when he destroys the auger and A.I.M. with it. And then sets his eyes on the real target and confronts Tony Stark. Earth bound during Infinity and the building of the Dyson sphere. What is interesting here is that Bruce had no idea about the collapse of the multiverse; meaning that none of the rest of S.H.E.I.L.D. does either, except of course Steve Rogers. 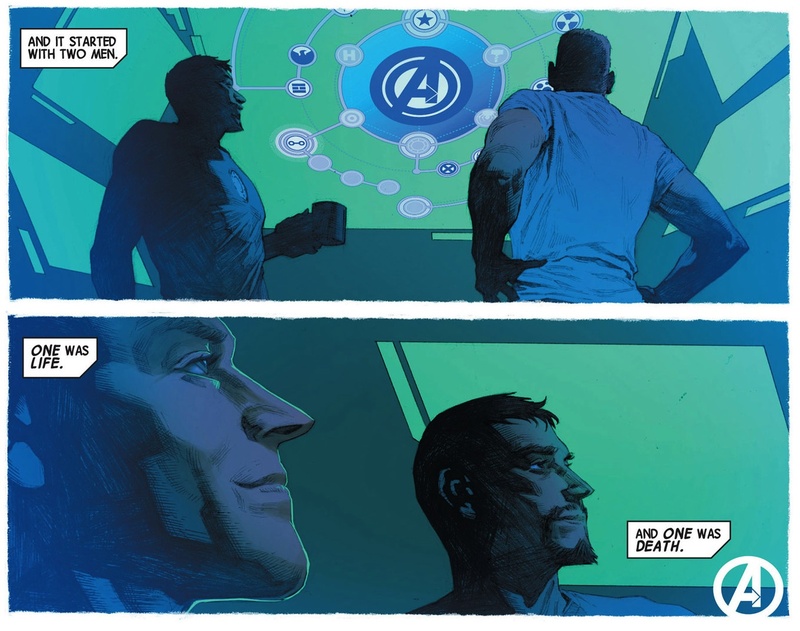 Bruce recognises the co-operative efforts involved in Tony’s crusade and the reformation of the Illuminati. There was a brief moment where I questioned why he was so mad at this and then I suddenly realised that it was they that sent Hulk off into space. They tried to eliminate him, as he was too big a threat to the planet, and thus began Planet Hulk followed by World Wide Hulk and his vengeance. Tony admits to the weapons he has created, including the Rogue Planet and the Builder’s Worldkiller. Then they hatch a very clever plan and use the alternate Bruce to allow our Bruce to exit his role at S.H.E.I.L.D. and join the Illuminati. Hulk destroys part of the Avengers tower and makes a hasty escape; meanwhile Tony uses the alternate Bruce as the scapegoat by controlling him and rendering him unable to speak. He was then handed over to S.H.E.I.L.D. and we have not heard from him since. As Bruce makes himself comfortable, the Illuminati are making preparations against their next incursion. Black Bolt – Bolt is seen healing at the beginning of the second act and Maximus is generally looking after him. He is around throughout the whole of the second act, observing incursions with the others and then being involved in fighting the Great Society. Where he is eight months later is anybody’s guess. Beast – The Beast is an interesting character because he has made some decisions of late that would make Xavier proud, and not in a positive way. He is responsible for weapon production and activation and has Bruce involved in the process. There is an issue of Avengers where he seems to be showing some allegiance to Scott and Roberto and asking for absolution (A#38). Where this comes into play is not entirely revealed but what we do know is that Cyclops seems to be hiding a Phoenix Egg under his sleeve. Back to the Avengers, Beast is part of the Illuminati and every now and again plays a moral card, knowing full well that it almost has no place being in the fray at all. His struggles manifest in a conversation with his younger self in A#23 where he finds no solace, none whatsoever. Stephen Strange – The earlier issues involving the Bridge saw various incursions but Stephen Strange was nowhere to be seen. This is because he has travelled to the Lost Lands to seek the Sinner’s market. As he enters the Throne, he is asked to barter his soul for the power he seeks. The answer is simple, the answer is all of it. Stephen sacrifices his being to become powerful enough to destroy a world and it is not until it is asked of him, that he wields it. The Great Society met their doom at the hands of Strange and it becomes quite clear that he has tapped into the forces of the Black Priests. The cost of this in the future remains to be seen, but we do see a glimpse of him in NA#27, but we shall come to that later. Tony Stark – Iron Man has had a very rough ride. The second act focused so heavily upon him being the evil villain that I am not quite sure the story provided the justification for the accusation, yet. We know from Rogue Planet and Cap’s time jumps that he is supposedly the cause of massive death and destruction. We also are aware that he has upset other heroes in simply forming the Illuminati, especially Banner. The New Avengers arc shows him planning weapons of mass destruction, but the real problem lies in the knowledge of his actions within the Marvel Universe. As readers, we all know what he is doing and what he has done, but no one quite understands why he is the victim of all the abuse. Cap attacks before his time jumps but this is more because he is upset by betrayal, and you could argue he is close to Tony than the other Avengers. I appreciate that it being an Avenger’s World was their idea, but there are other Illuminati members to blame in this situation. He talks to Black Swan in issue #18 and demands answers, but sadly there are none to give. His conscience is weighed upon heavily especially because he knows Steve is coming for him. The torment he undergoes makes me think less of him as a villain but more of a desperate man reaching his limits, limits that most normal people would have never even got to. The Marvel Universe have only just realised what he has been planning and the presence of a decaying multiverse. They seem to blame him but don’t realise that there are few people out there capable of saving the world. The Cabal are now carrying out his missions and no one has really batted an eyelid. He has become the scapegoat for the Marvel Universe, unless I am mistaken and there is yet to be a great sin committed by Tony Stark. The Illuminati come out of Infinity with the same mission they had before it: to fight incursions. They have a few weapons at their disposal but ultimately it is a war of attrition, on a physical and metaphysical level. As Reed uses the Bridge (an invention from Hickman’s Fantastic Four) which is essentially a television that can see into the future and show incursions, a troubled Panther catalogues the destruction of worlds (NA #16). As a point of reference, he sees forty worlds die without any intervention, five devoured by the Mapmakers, and two falling to the Black Priests. There was one world that survived two incursions because of an intervention, that interception was from a group of heroes called The Great Society. This issue began a new arc, which saw the moral fibre of the Illuminati being frayed further with the idea that they would need to fight other heroes in order to save their universe. The following issues saw the honourable heroes try to fight incursions without breaking their will. There was some lovely character exposition in these issues, especially from the Sun God and The Rider. Issue sixteen saw a blue incursion from the Sidera Maris i.e. the Mapmakers and Brother Norn uses The Word to kill them all and survive and incursion. This idea is returned to with Stephen Strange and the Black Priests and is an interesting power, not only at the disposal of the Great Society. It is worth mentioning that as this was revealed on the Bridge, Panther and Namor are almost friends. They drink to the future, Namor is fully aware of his regrets but Panther is undecided about his feelings and actions. Both have lost their people and their kingdoms, but neither really knows how to process or manage the future. One thing is certain; Namor is more stoic through it all compared to T’Challa, and the Bridge reveals that the next incursion is none other than the Great Society themselves. As both teams meet in issue #19, they discuss incursion survival tactics. The Wishing Box was a fascinating parallel of the Infinity Gauntlet, which showed The Great Society surviving an incursion by phasing their universe out of synch with the event. There is a wonderfully uncomfortable moment where T’Challa admits to owning a world-destroying bomb and Sun God just looks at him in shock. The only reply from the Great Society is that they have hope, a ridiculous ideal that is suitably followed by a quick quip from Namor. The almost pointless discussion of how to solve the situation enters into an emotional argument. This is a classic philosophical discussion regarding whose life is worth more and the fact that the Great Society are not capable of destroying a world, means they cannot possibly win. 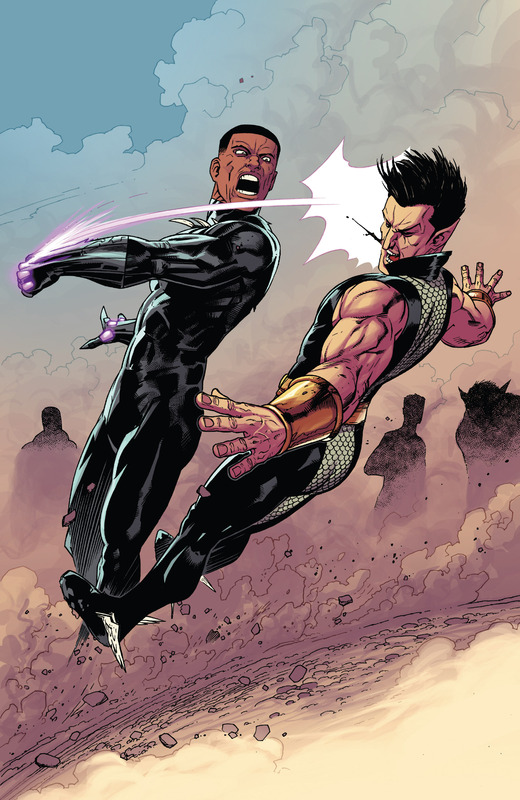 The unfortunate catalyst of Namor throwing his trident into Brother Norn brings the inevitable fight to the forefront. As much as there is an attempt at rationalising the destruction of a universe, we all know there isn’t one. The battle is quite entertaining as we see the Sun God out power the Hulk and Boundless dismantle Iron Man. What is most interesting is the Stephen Strange Norn fight where the magic of the Black Priests is tested. The sacrifices made my Strange are certainly revealed in a manner no one expected. His magical intervention stops the Great Society and then Namor destroys their world, when no one else could. Black Panther & Namor – These two characters are so importantly intertwined because they represent either side of the values of a King. This theme occurs throughout Hickman’s Avengers and is an idea T’Challa really struggles with. It began after losing his kingdom to his sister, and then the city being destroyed by Thanos. He is unforgiven by his people and has lost their allegiance so seeks counsel with the Panther Spirits of old (NA #18). They provide recourse in justifying the destruction of a world for survival, a task befitting a leader but T’Challa just cannot accept it. Being a King and being a God means going beyond morality, this is a fact that is readily accepted by Namor. Even at the very moment of pulling the trigger, T’Challa fails in front of his father and the Panthers before him. He breaks down and cries as he is scolded by the ancestral spirits and he is disowned by his father. Namor, who is equally lost and without his kingdom, has a deep resignation of the task at hand but does what the others cannot. As the Avengers reel in shock over what they have just seen, it doe not take long for their frustrations to be directed towards Namor. In all honesty, throughout the whole of the New Avengers title, they just could not take it anymore, the guilt and suffering was too much. Sadly T’Challa thinks that Namor took away his own personal decision, the parallel Earth was destroyed and it cost him his family. Unfortunately these decisions are far too difficult to justify in this manner, Namor was always going to make a decision in his best interests. Panther is not the leader of the Illuminati and Namor doesn’t need to reflect on T’Challa’s own disgrace. After their fight is broken up, the flashing of another incursion interrupts their solemn contemplation. The words. “It’s inevitable and I accept it”, take on a whole new meaning. Issue #23 is where everything changes and the Avengers’ naiveté becomes their undoing. 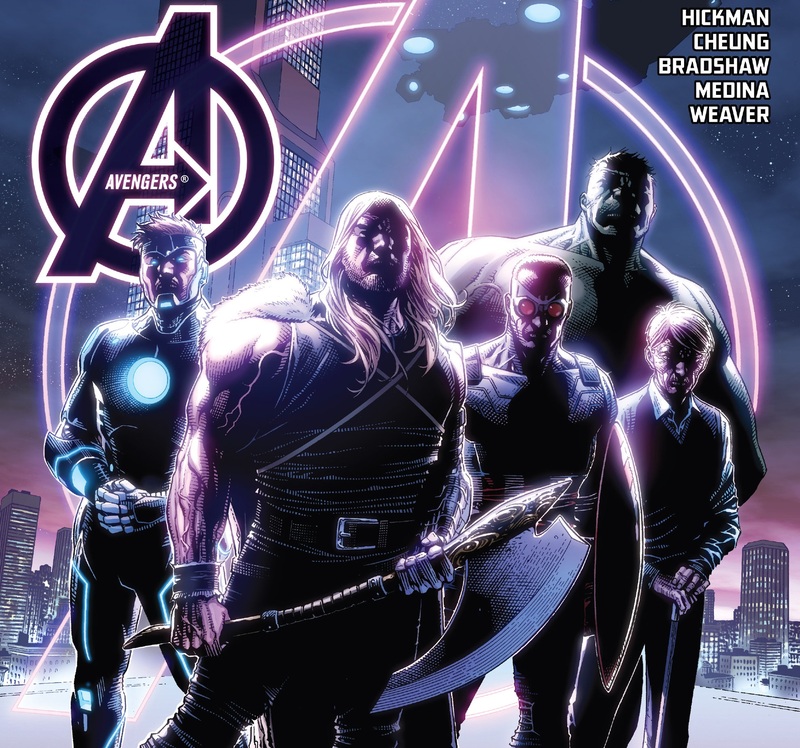 I reviewed the issue here (https://houseofflyingscalpels.com/2014/08/26/new-avengers-23-complacency-amidst-the-greatest-of-minds/). As they go about their day trying to find forgiveness and solace at the end of the universe, there is one man who is not about to let his sacrifices be in vain. As we watch the countdown, the Illuminati notice that they are still alive and head to the incursion point to investigate. They are shocked to see that Namor has taken new bedfellows and has formed a Cabal. Thus ends the second act of New Avengers. 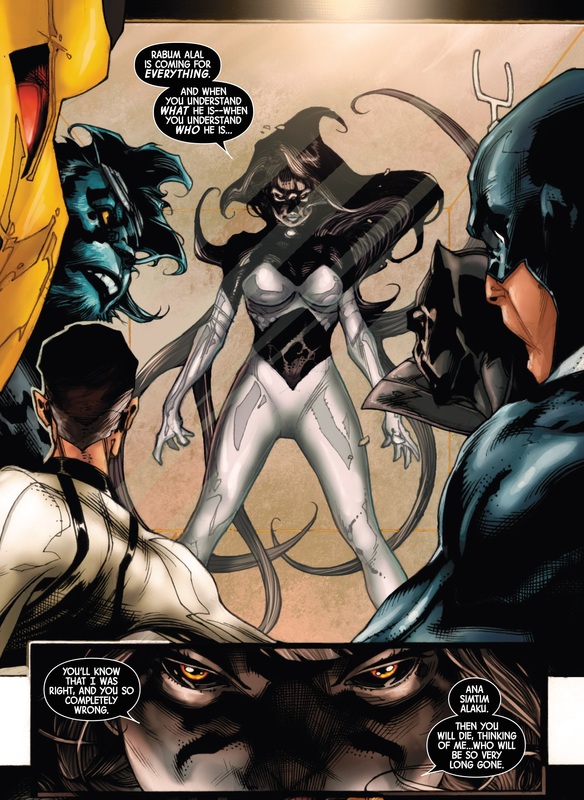 Black Swan – She comes across as a complex character and has featured in many conversations over the whole of the Hickman run. Her foreboding tones really hit Tony Stark at his lowest point in issue #19. However she approaches the whole situation from a very interesting perspective, a religious one. From the flashbacks seen in issue #15, her faith in Rabum Alal carries her through a large amount of travesty. We have viewed her exploits in other universes with other swans and other versions of Illuminati. She has guided our heroes through troubled times but the fact that she still features in the book means there may be a massive role for her yet. Her release by Maximus/Namor affords her the chance to survive and stop further incursions at the side of the Cabal. There is a fantastic scene where she talks to an incarcerated Tony Stark, where her usual depressing predictions are met with joviality and base flirtatious responses that irritate her. There is some indication that her only motive is to see her family live again, but to this day, she remains a bit of a quandary. Maximus – He has featured quite often in short excerpts and epilogues throughout the second arc. He is the reason why Thanos, Corvus and Proxima made an escape, as he used a microscopic laser to slowly excise them (NA #19). He has had delusions of grandeur throughout and gives an interesting monologue on the role of Kings when the Illuminati fight the Great Society. Maximus is also loyal to Bolt throughout and I am unsure as to their relationship at present. Terrax – This being has been sitting in a box for the whole of the second arc and most of the first. He barely talks but comments to Swan (NA#15) that times are changing, the world is decaying outside whilst everything inside their boxes lives. He is also released and joins the Cabal and is seen relishing the torture of Xavier in issue #24. Thanos & The Cull Obsidian– They have been incarcerated throughout the second arc and Glaive seems to have regenerative powers. Given he was a skeleton in the Thanos incarceration gem, he is looking quite healthy. The microscopic laser may have been used to allow air to enter so he could heal. Thanos has joined Namor as leader of the Cabal and is thoroughly enjoying the incursion wars. There are similar rituals occurring with this group as Glaive once again asks for a tribute. The heads of children is once again uttered and Thanos is sadistically unsympathetic in his murder of Xavier on Earth 71202. It has been a rough time for the Illuminati; they have lost their power to the Cabal who seem to be stopping incursions left, right and centre, fourteen in total. For some reason they are underground because they are being hunted by Rogers and S.H.I.E.L.D. As I alluded to earlier Steve seems to be obsessed with hunting them and bringing them to justice whilst the Cabal are destroying universes, in the public domain. I fail to understand the rationale behind this. 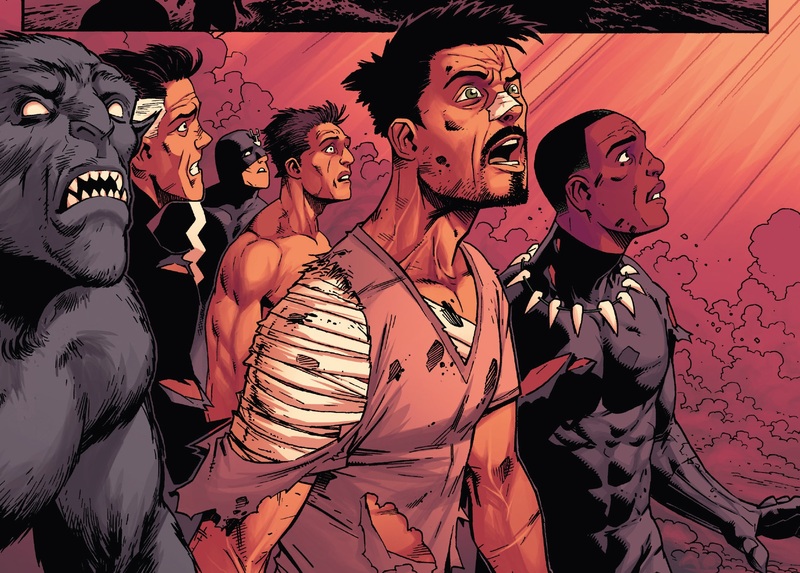 Hulk, Beast, Captain Britain, Reed are all on the run and Amadeus Cho, who is now an Illuminati member, is deliberately captured by S.H.E.I.L.D. as part of a greater scheme. I am unsure as to the whereabouts of Bolt, Dr Strange is leading the Black Priests and Tony is holed up in a box prison of his own making in Necropolis. Interestingly Iron Man seems to have tried to single handedly stop the Cabal but failed miserably, hence his incarceration (NA#26). 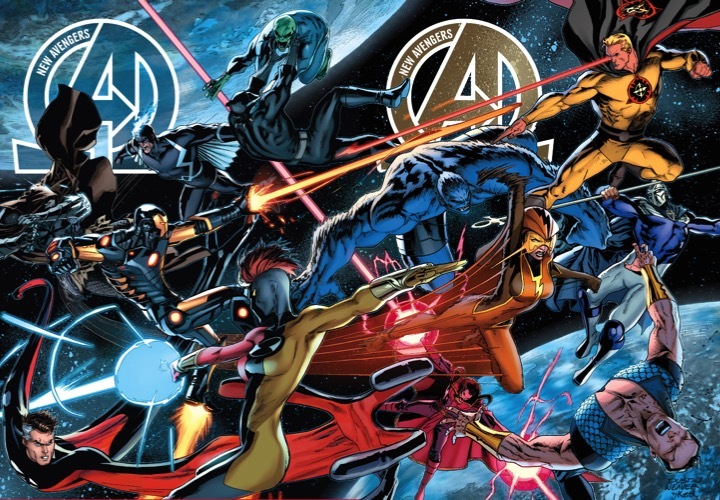 Avengers #39 saw the Illuminati come to surface and fight S.H.I.E.L.D. It was clearly a deliberate tactic to unveil themselves, and to show a partnership in being rescued by da Costa’s New Avengers. Bobby has become determined to convince Rogers to forgive the Illuminati, join their forces and stop the Cabal and unlock the secrets of the multiverse. Phew! 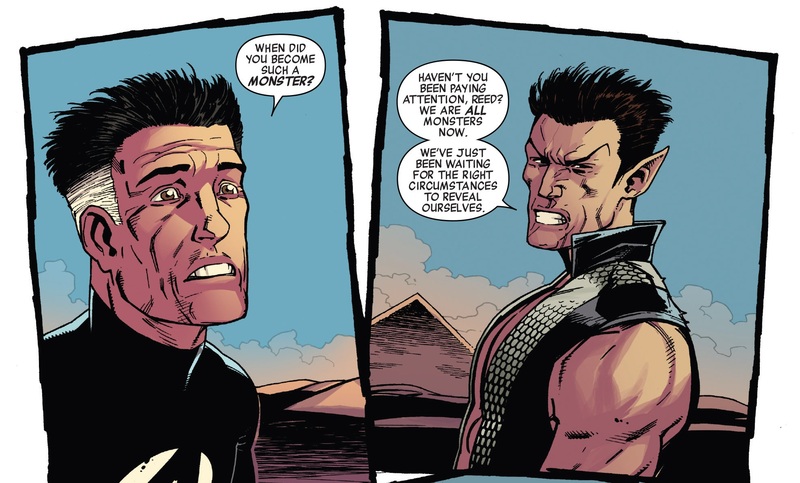 Namor shows some concern that the Cabal are reckless and controllable; they are relishing the atrocity. He voices these troubles to Dr Doom who is quite angry that he has become Namor’s second choice. As expected the Sub-Mariner is sent on his way and Doom sets about a plan involving the Mad Scientist and Molecule Man to find a solution. This aspect of the story is slowly developing and is likely to reveal the secrets of multiversal decay. 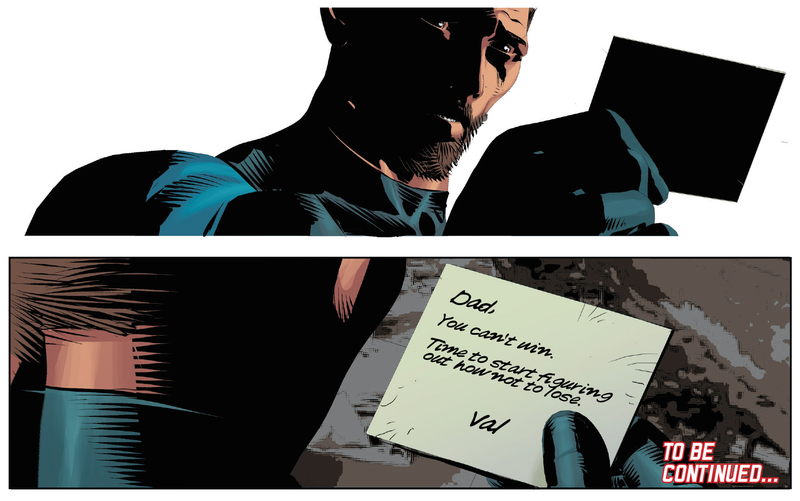 It is worth noting that Valeria sends a message to both Reed and Dr Doom in the latest issues. As always she knows what her father has been doing and plays the ominous voice of reason (Avengers #37). She sends a note saying they cannot win this war; they have to work out how not to lose. The Multiversal Avengers are playing a key role in the investigation of the decay. Immediately they encounter the Black Priests at their first jump in #27 of New Avengers. Here lays an important reveal, one that puts some optimism back into the Avengers, the fact that Dr Strange is their leader. He reveals that the Black Priests travel to an incursion and end a world already on the brink of destruction. They describe is as triage, which is interesting because that is exactly what Dr Spectrum said in issue #19. It is an ambitious plan to save everybody but removing the decayed universes is the only way to do this. 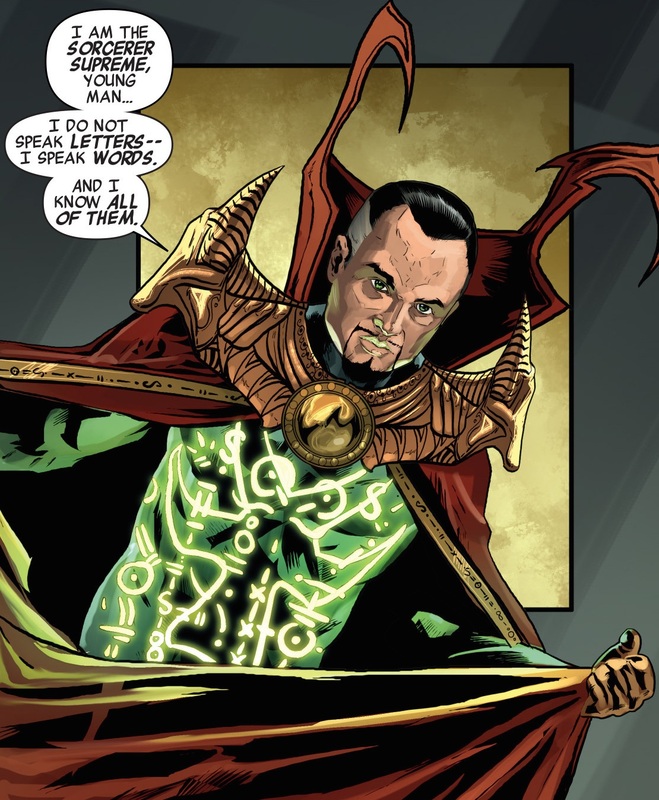 Their power is focused around ciphers and words and Dr Strange is master of them all. This fact is demonstrated by the word they used to destroy worlds, “Life”. The Black Priests, the Mapmakers and the Ivory King are three massively destructive forces that are destroying parallel Earths for one reason or another. We have ye to establish this completely but we can assume the Ivory King is probably a megalomaniac, the Mapmakers (whose precursors are adaptoids that were created by A.I.M. probably from some future stole technology) are charting worlds and destroying those that need destroying, and the Black Priests are altogether something different. We now know that Stephen Strange sold his soul to become the leader of these priests and has immense power channelled through words. So much power that it can destroy a world but he states that they are only triaging those decaying and doomed worlds, in order to save others. So it appears he will be on the side of the Avengers when the time comes to face Mapmakers and the Ivory King. It is worth mentioning that many universes have seen groups of heroes and villains amalgamate to help save their world. These include many incarnations of Illuminati and their world destroying weapons, the Cabal, who have taken over the task on our Earth and The Great Society who were killed by our Illuminati. These represent the primary defence to their Earths being destroyed, but ultimately they need weapons to destroy opposing planets to actually survive. This is where the morality of our Avengers waivers so delicately. What is actually happening on Earth? We seem to be massively distracted by the one-man mission of Steve Rogers to capture the Illuminati. They are no longer in power and are fractured into pieces. Meanwhile there are news reports of The Cabal destroying worlds and S.H.I.E.L.D. seems to be massively uninterested. Cap will not forgive Tony for betraying him and creating the Illuminati and then allowing them to expel him. Add in Sue who is pretending to hate Reed, and the good soldiers Maria, Clint and Carol and you have S.H.I.E.L.D. not the Avengers, as we seem to be insistent on calling them. 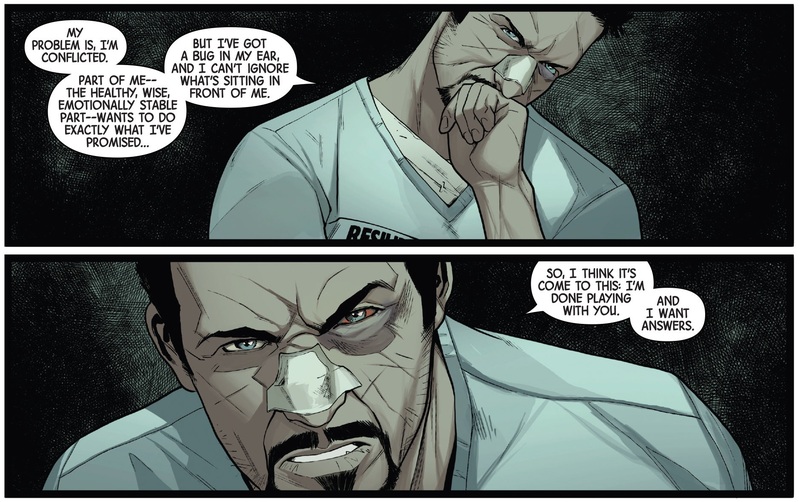 Tony Stark remains incarcerated by the Cabal and no one seems to be interested in rescuing him, except for Widow and Spider-woman who decided against it. I find it amusing how easy it was for them to find him when S.H.I.E.L.D. and the Illuminati have failed. Let us not forget Bobby da Costa who has actually taken an interest in the multiverse, sent out an Avengers force to tackle it using A.I.M. tech, which he now controls, and then try to settle the differences between the Illuminati and Steve. Let be honest, they need to merge. Steve must remove his arrogance from the situation and face reality that the world is going to die without rescuing Tony and reforming the Avengers. Then they can sort out the Multiverse situation and remove the Cabal from the equation. I have to be honest and say that I am in love with Hickman’s world building stories. I am thoroughly enjoying his FF and Fantastic Four Omnibus books but there is always a shortcoming with his writing. He takes on the big decisions, the huge moral questions but instead of treating them like the true philosophical debates they are, he washes over them somewhat. It is probably unfair of me to ask more because there are some fantastic moral arguments throughout, especially when T’Challa failed to destroy a world. But the ideas never come to complete fruition except that one has to fail in order to save everyone else. That idea is a beautiful one but it gets lost in all the action and emotional reactions. The story is engrossing enough and confusing enough for me to write this many words, so I am certainly being too harsh. But I would love to see this become a philosophical ending with some ridiculously convoluted dialogue, but on the other hand Id love for the Avengers to kill the Ivory King and restore the multiverse. I do love superhero stories after all! 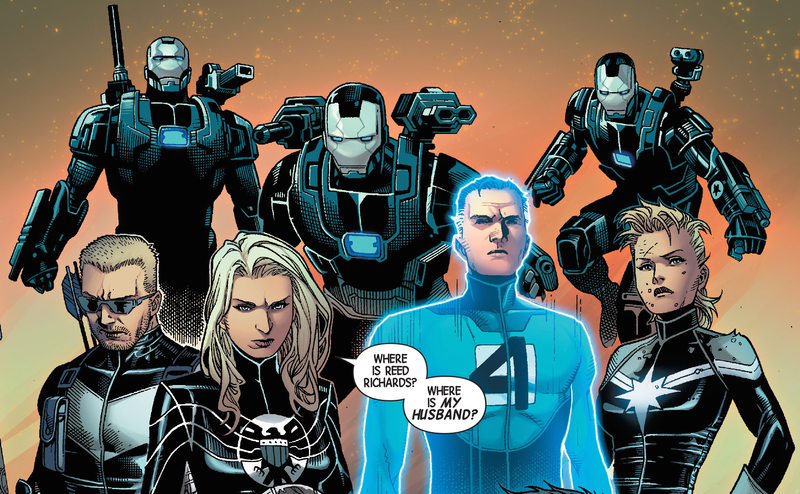 Before I finish I want to talk about this panel, one that features in many of Hickman’s Avengers books. One that I have also talked about before, but it brings interesting reflection as the tale continues. Steve and Tony sit on opposite sides of the fence. Steve as the all American hero will not budge from this position of saving everyone, but his attitude is too naïve for the multiverse collapsing. 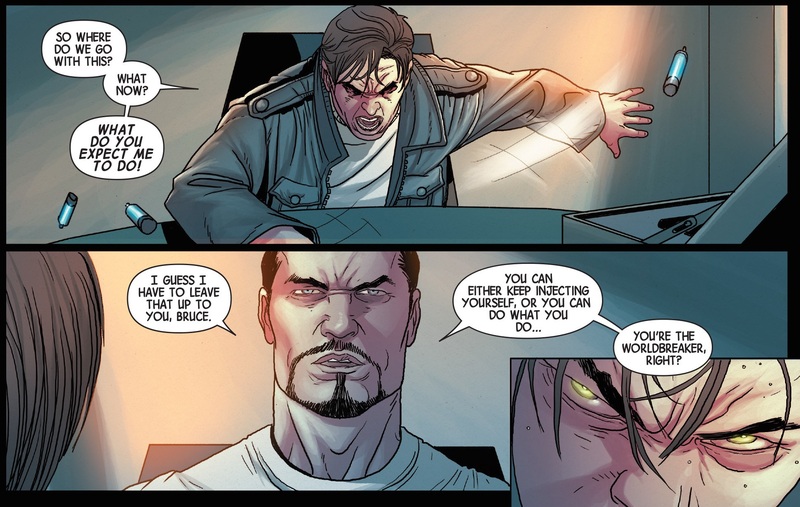 He has focused his hatred on Tony in order to not think about the world around him. Stark is a weapons manufacturer at heart and had a dubious moral conscience. This meant it was easier for him to build weapons and create the Illuminati because he is willing to accept the immoral consequences of his actions. Sadly it is second nature to him and his arrogance pervades even at the time of his incarceration. Hickman has desperately tried to make this into a good guy bad guy story but so much has happened that the idea has been completely lost. But I believe this was his intention because to encounter these difficult decisions requires conviction and sacrifice and Cap is just unwilling to do that. So if you build Tony into this huge villain which even people from the future hold responsible, then his essential part in the conclusion to this book will be all the more emphatic, because he will save the day. You cannot deny the immeasurable detail that has gone into this storyline because it is literally insane. It is beginning to come together and there are some exciting times ahead, especially when we finally see the Ivory King and the source of the Multiversal collapse. I also remain convinced that the Black Swan will play an enormous part in this and religion will feature more heavily. This is classic Hickman work at play and I for one, cannot wait to see where it ends. If you got here then I thank you for your time and patience. I hope you found it worthwhile because I absolutely loved writing every word of it. P.S. Someone tell me where the hell Captain Universe has gone and why no one talks about God anymore (Except for Black Swan)! P.P.S. If there are any errors in this post then I would be grateful to know so that I may correct them! Previous PostThe Theatre List – Instagram Bat! What would Bruce say? Couple of corrections. There is no such thing as Ebony King/s. The one reference to them was confirmed by Hickman as a lettering error. It’s Ivory Kings (plural) and they’re at war with Rabum Alal. Also destroying a universes earth stops it from experiencing incursions but it will still die from the multiverses collective timeline contracting. The Black Priests believe that if enough earths are destroyed they can stabilize the multiverse as a whole but there is no guarantee of that. At the same time, with all the information overload, doesn’t Hickman sometimes seem like he’s dragging his feet. I’m getting out epic-ed here, and it’s a *constant* stream of doom and foreshadowing and promises that something cosmic is about to happen but it keeps not happening. Occasionally a major revelation, a shakeup of the status quo, but then more slow-paced doooooom. Hey Ray! Thanks for your comment. Hickman is a strange one, as I alluded to at the very beginning I had lost some faith in the story. It only came back because New Avengers was so compelling. But you are right, he promises much, so much so that the actual events may never live up to the hype. For example Iron Man’s fall seems to have happened? Was it the creation of the Illuminati and destroying planets, which he wasn’t doing alone. Infinity gave no conclusions to the Builders motivations and we have yet to see what is destroying the multiverse. Most importantly is whether he delivers conceptually. The idea that Cap is life and Tony is death is waiting to be fleshed out, I fear we may have seen the crux of it already. The ideas of destroying a world for survival have been expressed through the moral consciousness of Panther and Namor, it would be great to see it looked at further, given that it is an inevitability within the context of the story. Though it does still excite me, especially if the story makes rapid progress. We shall see! This a very impressive article. It will be interesting to see what you think of New Avengers 30. It shows the Beyonders for the first time. About a year ago I had emailed John Hickman and asked him if the Beyonders were playing a part in this story. He never answered back. It also seems the Beyonder himself might be the king involved in all of this. Given that the new story line is called Secret Wars and the fact that the Molecule is emitting a wave at the same frequency as the incurresion points. *Meant to say the Molecule Man. His origin and the Beyonder are connected to each other. By the Beyonders themselves actually. You see Molecule Man could be the reason Earth is the focal point. However it might be more than just that. Hickman said the Celestrials were not going to be in the story a year ago in a interview. He must have changed his mind.